BEECO offers several types of heat transfer solutions to meet your process needs. Plate and frame heat exchangers offer superior heat transfer rates, are easily serviced and have a low foot per thermal transfer BTU. See our plate and frame heat exchanger services provided here. 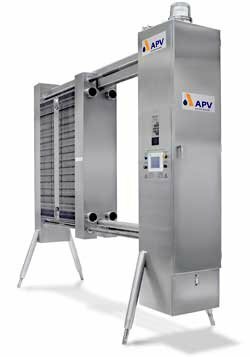 For pulpy products or unique viscosities we offer multi-tube and tube-in-tube heat exchangers. For hot sets, we offer shell & tube heat exchangers that are superior in handling steam to water heat transfer without allowing the steam to deteriorate the materials within the heat exchanger.